Resisting fossil fuels. Working for climate justice. After a long week of heavy rain, the skies finally cleared and the smokestacks of the Phillips 66 refinery became visible once more on the horizon line directly behind the children’s playground at Rodeo Hills Elementary School. On the evening of March 7th, the school’s auditorium became the site of a community town hall meeting about Phillips 66’s related proposals to refine Canadian tar sands crude. Around 140 residents of Rodeo, Crockett and Hercules—and a smattering of folks from further down Highway 80—enjoyed a good meal together and then heard about the potential impacts of Phillips 66’s less than savory projects. Rodeo is a resilient town; people don’t complain much and soldier on, but the truth of the matter is that living right next to a refinery takes its toll. And now people were worried that things could take a turn for the worse. Janet Pygeorge, a co-founder of the venerable Rodeo Citizens Association, is 83 years old and has been a refinery critic for several decades. She opened the town hall with a pointed reference to off-the-charts community cancer rates and an impassioned plea to “make America green again.” Then Greg Karras, a Senior Scientist for Richmond-based Communities for a Better Environment, gave a sobering presentation on the refinery’s plans to refine highly toxic “price-advantaged” tar sands crude, or bitumen. This is an asphalt-like substance mined out of now devastated First Nations land in Alberta, Canada. Formerly magnificent boreal forest has been leveled with Mordor-like devastation by the mad pursuit of bitumen, which has poisoned soil, air and water and threatens to forever destroy thousands of years of indigenous life on the land. Local environmental activists fear that this destruction will continue all along the length of the supply chain to the Bay Area. Solid bitumen is diluted with highly inflammable and carcinogenic propane, which allows it to be transported through pipelines, containerized, and loaded onto oil tankers. This diluted form is called dilbit. From Vancouver and other ports, it’s shipped down the Pacific coast to Bay Area refineries, where small amounts of it are already being refined. If Phillips 66 has its way, vastly increased quantities of tar sands crude will be delivered to the P66 wharf for refining at its Rodeo facility. P66’s Propane Recovery Project was already approved once by the Contra Costa County Board of Supervisors, then litigated in the courts, and is now pending a second round of county evaluation. A new Environmental impact Report will likely be circulated for comments in April. The second P66 proposal—the Wharf Permit Revision Project—involves a vastly increased number of permitted deliveries to the refinery’s wharf, which could mean a tenfold increase in imported tar sands crude. There are two major consequences of this. The first is the amplified threat of spills in the Bay, which could seriously pollute both air and water. When spilled, tar sands crude doesn’t float; it’s so thick that it sinks to the bottom, where it would remain to release toxic chemicals. And when tar sands crude is refined, a whole slew of dangerous pollutants are released into the air, threatening both climate and community health. Oncologist and public health specialist Jan Kirsch, MD addressed the dangerous air pollution impacts of tar sands refining. She pointed out that Rodeo already suffers from the impacts of pollution and can ill afford any increase of toxic assaults. The community already ranks in the state’s 97th percentile for hazardous waste, according to the state Office for Environmental Health Hazard Assessment (OEHHA), and in the 80th percentile for pollution. Pollution-caused disease rates also run high: Rodeo ranks in the 75th percentile for cardiovascular disease, in the 92nd percentile for low birth weight, and in the 97th percentile for asthma. Tar sands refining means dangerous increases of heavy metals and other carcinogenic substances, as well as deadly particulate matter—of which there is no safe limit, according to a very recent EPA study. Refinery neighbors would pay even more dearly in health costs to promote the refinery’s bottom line. Right now the Wharf Permit Revision is in a kind of bureaucratic limbo, with both the Bay Area Air Quality Management District and Contra Costa County displaying extreme reluctance to take the lead in approving or disapproving the project. But the Air District recently approved an increase in the amount of oil that can be processed in a unit essential for refining very heavy crude oil, such as tar sands. And the potentially explosive Propane Recovery Project could be approved a second time by the county’s supervisors, who with one exception were previously unconcerned about the magnitude of the associated blast zone. 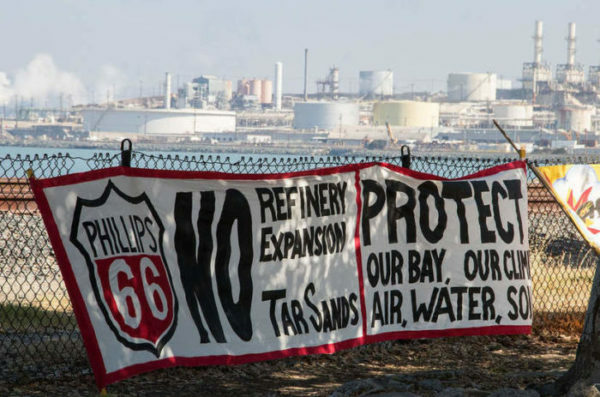 Impacted Contra Costa residents who live near Phillips 66—Rodeo, Crockett, Hercules and Port Costa—can call their County representative, Supervisor Federal Glover, at (925) 608-4200 to express their concern. And everyone in the Bay Area can contact Glover as well as the entire county Board of Supervisors, whose addresses can be found at http://www.co.contra-costa.ca.us/193/Board-of-Supervisors. Please tell our elected officials that Contra Costa County needs to protect its communities from a proposed refinery expansion that so clearly threatens air and water quality, and the worsening climate. The county must do its due diligence, step up to its responsibility, and become the lead decider—i.e., the lead California Environmental Quality Act (CEQA) agency—for the Marine Terminal Permit Revision Project. Additionally, you can weigh in by signing a petition addressed to Contra Costa supervisors, as well as the Bay Area Air Quality Management District and even Governor Newsom: http://bit.ly/2EFbjYZ . For continuing updates on this issue, please keep checking in here. And visit the website for Crockett-Rodeo United to Defend the Environment, or C.R.U.D.E., at https://crockett-rodeo-united.com/. See Greg Karras’s Rodeo Town Hall PowerPoint presentation: CBE 7 Mar 2019 Slides. And the November 19, 2018 presentation to a Special Meeting of the BAAQMD Board of Directors: Update on Canadian Oil Sands Crude. Our Mission: Don’t Mourn, Organize! The Sunflower Alliance is made up of grassroots individuals and organizations committed to environmental justice and the health and safety of all our San Francisco Bay Area communities threatened by toxic pollution and climate disruption. An all-volunteer group, we are helping to build an equitable, sustainable, and regenerative economy fueled by renewable energy, love for Mother Earth, and the vigorous pursuit of justice. Let’s go!